What is (or are) Blacksmith Buddies? 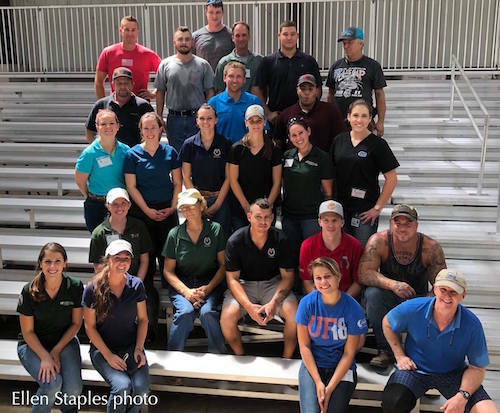 A few years ago, University of Florida College of Veterinary Medicine students and local farriers joined forces for mutual education and camaraderie. It was such a success that it has gained momentum and now has an extended program of both informal ridealong opportunities for students and multiple educational events for both students and farriers during the school year. Ellen Staples, CFJ, is a member of the Class of 2020 at the University of Florida CVM and previous coordinator of the Blacksmith Buddies program. 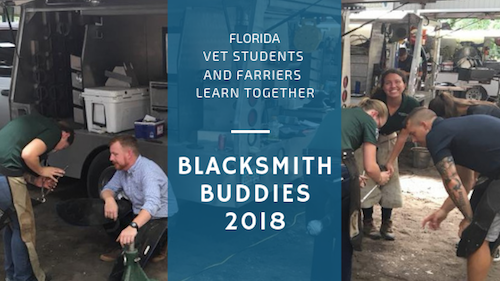 Blacksmith Buddies had another fun and educational event on Saturday, September 8, 2018 in Gainesville, Florida, bringing together University of Florida veterinary students and farriers from all over Florida and Georgia. Travis Burns, CJF, TE, EE, FWCF, and current AFA president, kicked off the event with an audience-participatory presentation of questions that are asked by not only the owner, but by the farrier and veterinarian as well. The case horse used in the event had a history of Cushing's disease, laminitis and sub-solar abscesses. Using the University of Florida's Large Animal Hospital facilities, the "buddies" worked with guest clinician Travis Burns and local veterinarian Brent Barrett to prepare a plan of treatment for the horse. The presentation also explored many of the communication issues that farriers and veterinarians face working as a team, and ended with a review of shoeing and trimming goals of the laminitic horse. 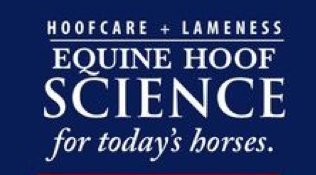 Brent Barrett, CJF, DVM and Travis then worked up a horse with a history of Cushing’s disease with subsolar abscesses and laminitis. Radiographs and venogram of the feet were performed, revealing keratomas in both front feet. 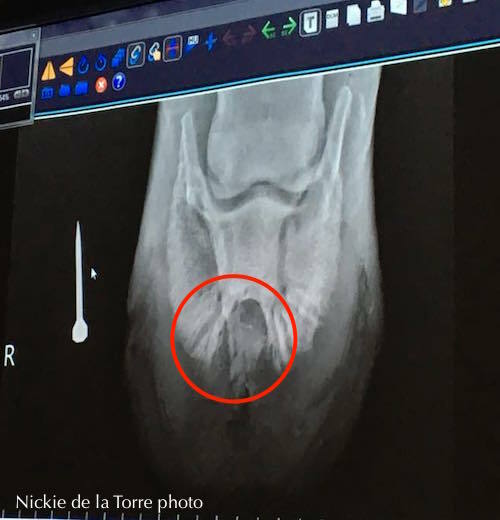 Radiographs of the clinic's live demonstration horse showed that the horse had keratomas (horny tumors) in both front feet. The group then returned to the classroom to discuss the venogram and baseline radiographs as well as to participate in the shoeing and treatment plan for the horse. 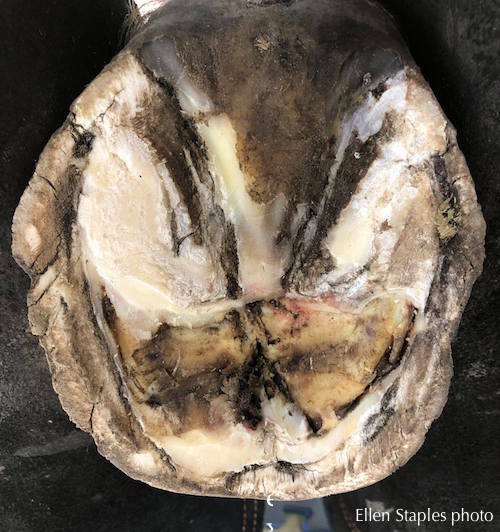 This case of bilateral keratomas in the front end of a horse was an incidental finding when evaluating the horse for chronic laminitis. He has had draining solar abscesses just dorsal to the apex of the frog for months and would periodically become 3/5 lame. A venogram revealed no attenuation of blood flow to any aspect of the foot, and detailed the margin of the defect quite well. Because the circumflex artery was so intact, we suspect that these are in fact keratomas instead of osteomyelitis of the crena or dorsal notch. One of the vet student-farrier teams prepared a test case cadaver limb with an EponaShoe with packing material. Management of this horse is limited to trimming (financial constraints) so therefore no shoeing was done that day. The gold standard of treatment would have been surgical removal of the keratoma-affected hoof wall with proper margins to either side from the coronary band down. 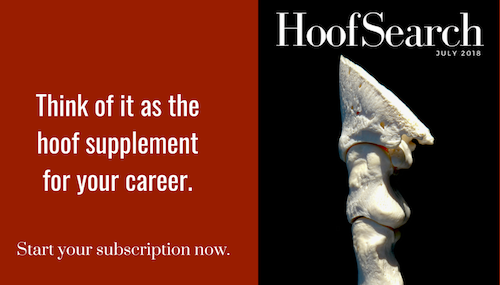 Stabilization of the hoof capsule would be achieved with two dorsal horizontal aluminum brackets. One bracket would be just distal to the coronary band; the second would split the difference to the ground and be attached with glue and screws. A shoe would be placed on the foot while the horse is under anesthesia for the surgery, so indirect glue on shoes are preferred. 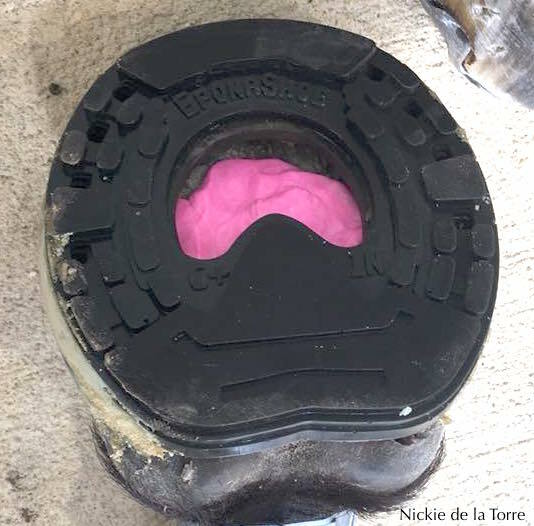 The shoe would have a frog plate or bar for hoof stabilization and the back half of the foot would be poured with a pad or filled with impression material for solar support and load sharing. A hospital plate would then be placed on the bottom of the foot and the affected dorsal area of the foot would be packed with medicated gauze for the next 3-5 weeks or until sufficient epithelialization of the exposed lamina is noted. It would be recommended to keep the area wrapped for the next two to four weeks. Both front feet would most likely be done at the same time. Due to the horse's systemic disease (Cushings or hyperadrenocorticism), its prognosis is a bit more guarded when compared to an otherwise healthy horse. Additionally, its history of chronic laminitis would negatively further affect the prognosis. This horse’s job (or lack thereof) means that maintaining him barefoot with routine cleaning and treatment of the sole is preferred. Because of the clinic horse's extensive subsolar draining abscesses, it was decided to trim and wrap both front feet with daily application of anti-fungal and anti-bacterial medication, such as 8% tincture of iodine for one to two weeks. 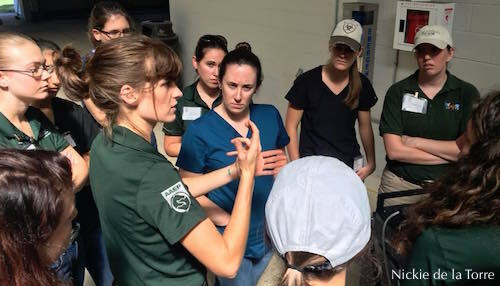 Ellen Staples, CJF and Class of 2020 vet student at the University of Florida College of Veterinary Medicine, explains the principles of a case to fellow students. 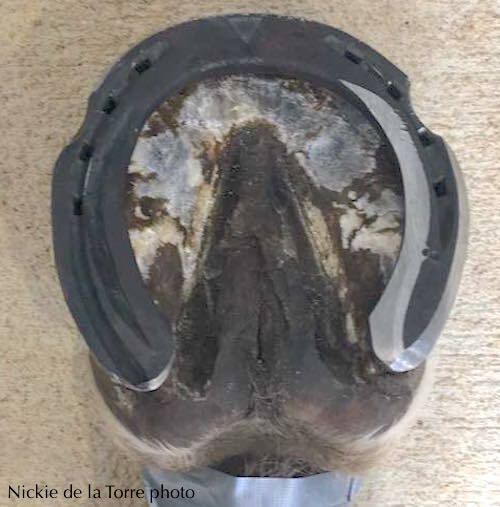 After the resolution of these draining abscesses, a plan was made to manage the horse barefoot, if possible, or to proceed with either nailed or glue-on shoes with appropriate sole support provided by a pour-in pad or impression material. The front half of the foot would most likely be left open for continuous treatment of the area even while shod. The farriers and veterinarians were then split into teams of two; each was given a theoretical case with radiographs and a cadaver limb. They spent the next hour deciding on a shoeing and treatment plan and shod the limb together. The event was finished off with several farrier and student-team eagle eye competitions with prizes donated by Equicast, American Farriers Journal, and Fran Jurga’s HoofSearch. Vet student and farrier learn shoeing solution for a case of a lateral collateral ligament injury of the coffin joint. A big thank you to all of our student and farrier participants, Travis Burns, and Dr. Brent Barrett for making this event a great success! Please "like" the Blacksmith Buddies Facebook page ("Blacksmith Buddies") for information and updates on future clinics and events. Blacksmith Buddies: (left to right) Row 1: Nickie de la Torrre, Julia Dagget, Julia Nelson, Camp Thomas; Row 2: Samantha Tierney, Daryl Beah, TJ Steele, Kevin Mead, Clint Loomis; Row 3: Sara Beth Spezick, Sara Allred, Erin Dublac, Megan Matloff, Sara Neille Timberlake; Row 4: Travis Burns, Andre Ortiz; Row 5: Bruce Martin, John Brennan, Nate Black, Chris O'Malley. Nickie de la Torre and Julia Daggett are the current coordinators of the Blacksmith Buddies program. Hoof Blog history note: Blacksmith Buddies, the educational organization, is not directly related to Blacksmith Buddy, the innovative leg holding system designed by California farrier Wes Champagne. The student/farrier group used one of Wes's Blacksmith Buddies at their first meeting--and the name just stuck! 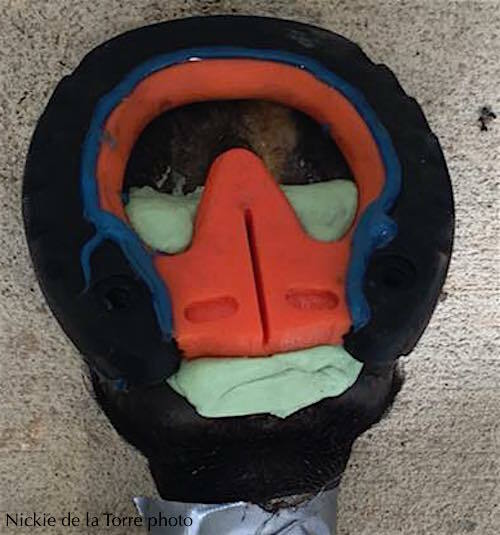 To read more about Wes Champagne and his ingenious invention, click here to visit the Hoof Blog's dedicated story about the Blacksmith Buddy and how to use it. To order your subscription (12 editions), click here.